One morning last October, Miami’s municipal government issued a warning to drivers in the area: they should avoid much of the city’s center, because it had been inundated. “Today, Miami is flooding as if a hurricane went through it,” the city’s mayor wrote on Twitter. 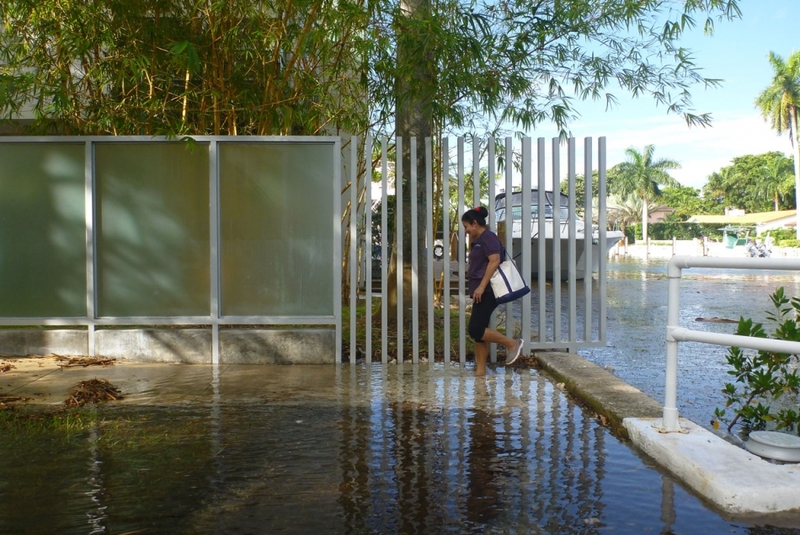 Coastal flooding in the Coconut Grove neighborhood of Miami, Florida in October, 2015. Many minor floods are a matter of inches rather than feet, but some — like last October’s in Miami — are deep enough to disrupt traffic and other systems. Even a few inches of water in the basements or ground floors of homes and businesses can ruin floors, furnishings, and other possessions, requiring extensive cleanup. Over time, the damage adds up. Standing water can weaken infrastructure. The sea level rise that underlays flooding can increase the salinity of coastal soils, degrade water quality, and make it harder for crops to grow. Further increases are likely coming. In an average year this decade, 30 sites selected by Climate Central saw a total of 153 days of floods, according to data from NOAA. (Sites were selected based on geographical representation and data availability.) 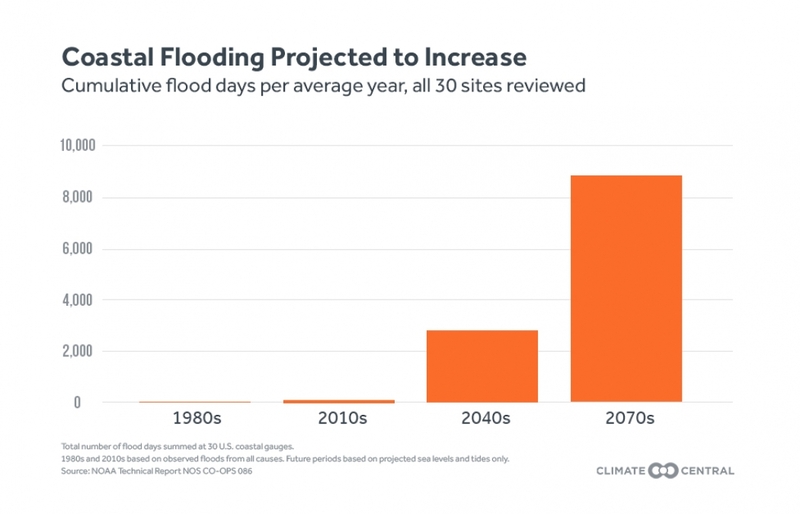 In an average year in the 2040s, those 30 locations would see around 2,850 floods. In the 2070s, the numbers would be higher still, at 8,873. While flood counts for future decades include the effects of sea-level rise and high tides, flood counts for past and present decades are also shaped by storm surges. These projections assume a sea-level rise of 3.3 feet over the course of the century — what NOAA calls an “intermediate” scenario. The United States seems set for a major increase in minor flooding. As the moon orbits the Earth, its gravity tugs on the oceans, making the tides ebb and flow. When the moon and the sun align, they compound each other’s pull, producing higher tides than usual. That happens about every two weeks. In the late fall and early winter, the Earth is closer to the sun than it is during the rest of the year, making the biweekly high tides even higher. These “king tides” are shaped not just by solar and lunar gravity but also by local factors, from rainfall and water temperatures to coastal topography and ocean currents, such as the Gulf Stream. On the East Coast and Gulf Coast of the United States, the peak tide comes between September and November. On the U.S. West Coast, it’s between November and February. How many floods will those months see in the years ahead? To visualize changes in flooding rates, Climate Central counted the number of floods occurring or projected to occur in two separate months in recent and future decades — October for sites on the East and Gulf Coasts, and December for sites on the West Coast. Past and present flood counts were based on simple observations from tide gauge records of days when water levels exceeded what NOAA calls the “minor flood threshold.” Totals include floods of any size above this threshold, caused by any combination of factors, such as sea level rise, tides, and storm surge. Projected flood counts, on the other hand, factor in only projected sea-level rise and tides, and are thus biased low. The sea level projections assumed a high emissions scenario. NOAA has developed definitions of minor flooding thresholds that vary by location. Those thresholds, used here, often lie around 1.6 feet above the average water level at high tide — a point at which, in many places, water levels start to cause problems for local infrastructure. Projected changes in coastal flooding across the U.S. The increases in flooding — mostly minor flooding — that the United States has recently experienced are due in large part to climate change. Without the higher sea levels produced by our warming climate, 76 percent of the coastal flood days that occurred at 27 locations across the continental United States between 2005 and 2014 would not have happened, an earlier report by Climate Central found. Warming, in turn, is the result of emissions of carbon dioxide and other heat-trapping gases. As the saying popularized by Margaret Davidson, a former director at NOAA, puts it, today’s floods are tomorrow’s high tide. To create a new visualization of changing flooding rates over time, Climate Central calculated the number of tidal floods that have occurred or are projected to occur in Octobers and Decembers in recent and future decades. Observed water levels were used to count present and past floods, which were driven by changing sea levels over decades, shorter term fluctuations, tides and storm surges. Future hourly water levels are based on detailed tidal projections and sea level rise projections only. Tidal projections are based upon tidal harmonic constituents currently available from NOAA, related to periodic variation in the relative positions of the earth, moon, and sun. Median local sea level projections from Kopp et al. (2014) were used assuming a high emissions scenario (specifically, Representative Concentration Pathway 8.5) Sea level rise projections begin in the year 2000, and consequently must be added on top of the mean sea level for 2000. We determined the mean sea level for 2000 by adjusting from NOAA's baseline sea levels for the standardized tidal period, using the local rate of sea level rise for each tide gauge at that time. Projected water levels smooth out the variations in sea level that naturally occur in observed water levels. This may lead to some inconsistencies in comparing observations and projections. For example, there was a relatively large number of floods in the 2010s in Wilmington, NC., likely due to factors not captured in projections, such as dredging of shipping channels that may have enhanced tidal flows and storm surges. As a result, projected flood counts, which do not take factors like dredging into account, may be closer to current flood counts than otherwise expected, or even lower than them. In the case of Wilmington, if the same dredging and effects carry into the future, actual flood counts are likely to be greater than projected. Days were counted as flood days if a site’s daily maximum water level exceeded NOAA’s location-specific derived minor flood threshold. To represent a typical October/December month for a given decade, the year with the number of flood days at the median for that decade was selected and represented on the calendars. The calendars are meant to provide a realistic flavor of future months, based on actual tidal sequences for some years, but should not be taken as projections for individual days. While tides can be forecast decades in advance, short term variation in sea level from shifting winds, currents and storms cannot.